ZEMAN DANIEL (2018). 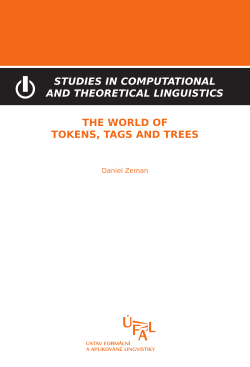 The world of tokens, tags and trees. Copyright © Institute of formal and applied linguistics, Charles University, Prague. ISBN 978-80-88132-09-7. 158 pp. NOVÁK MICHAL (2018). Coreference from the cross-lingual perspective. Copyright © Institute of formal and applied linguistics, Charles University, Prague. ISBN 978-80-88132-06-6. 162 pp. RYSOVÁ MAGDALÉNA (2018). Diskurzní konektory v češtině: Od centra k periferii. Copyright © Institute of formal and applied linguistics, Charles University, Prague. ISBN 978-80-88132-05-9. 198 pp. VESELOVSKÁ KATEŘINA (2017). 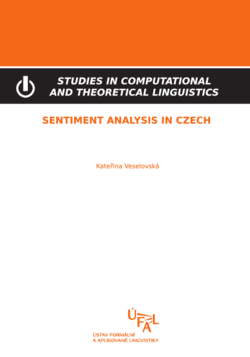 Sentiment analysis in Czech. 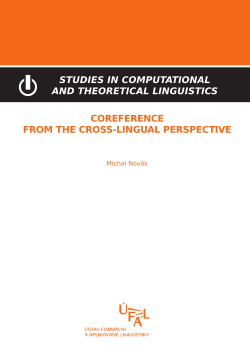 Copyright © Institute of formal and applied linguistics, Charles University, Prague. ISBN 978-80-88132-03-5. 159 pp. ČECH RADEK (2016). Tematická koncentrace textu v češtině. 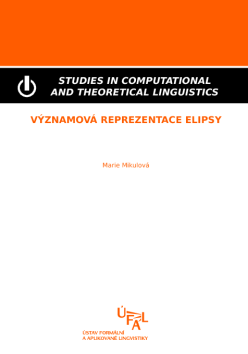 Copyright © Institute of formal and applied linguistics, Charles University, Prague. ISBN 978-80-88132-00-4. 236 pp. ZIKÁNOVÁ ŠÁRKA, HAJIČOVÁ EVA, HLADKÁ BARBORA, JÍNOVÁ PAVLÍNA, MÍROVSKÝ JIŘÍ, NEDOLUZHKO ANNA, POLÁKOVÁ LUCIE, RYSOVÁ KATEŘINA, RYSOVÁ MAGDALÉNA, VÁCL JAN (2015). Discourse and Coherence. 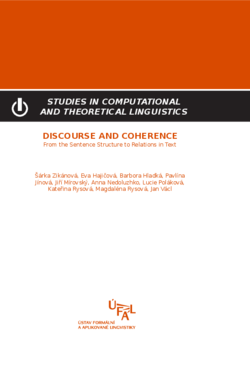 From the Sentence Structure to Relations in Text. 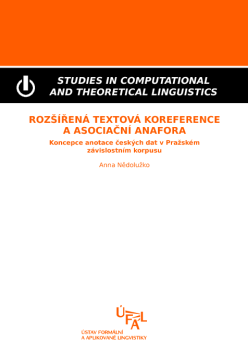 Copyright © Institute of formal and applied linguistics, Charles University, Prague. ISBN 978-80-904571-8-8. 274 pp. ŠTĚPÁNKOVÁ BARBORA (2014). Aktualizátory ve výstavbě textu, zejména z pohledu aktuálního členění. Copyright © Institute of formal and applied linguistics, Charles University, Prague. ISBN 978-80-904571-6-4. 149 pp. RYSOVÁ KATEŘINA (2014). O slovosledu z komunikačního pohledu. 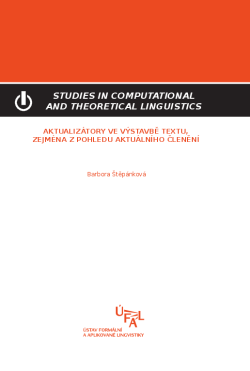 Copyright © Institute of formal and applied linguistics, Charles University, Prague. ISBN 978-80-904571-5-7. 232 pp. BOJAR ONDŘEJ (2012). Čeština a strojový překlad: Strojový překlad našincům, našinci strojovému překladu. Copyright © Institute of formal and applied linguistics, Charles University, Prague. ISBN 978-80-904571-4-0. 162 pp. NĚDOLUŽKO ANNA (2011). Rozšířená textová koreference a asociační anafora. Copyright © Institute of formal and applied linguistics, Charles University, Prague. ISBN 978-80-904571-2-6. 268pp. UREŠOVÁ ZDEŇKA (2011). Valenční slovník Pražského závislostního korpusu (PDT-Vallex). 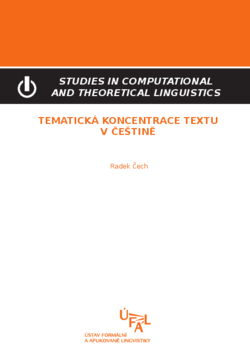 Copyright © Institute of formal and applied linguistics, Charles University, Prague. ISBN 978-80-904175-1-9. 375 pp. UREŠOVÁ ZDEŇKA (2011). Valence sloves v Pražském závislostním korpusu. Copyright © Institute of formal and applied linguistics, Charles University, Prague. ISBN 978-80-904175-0-2. 229 pp. MIKULOVÁ MARIE (2011). Významová reprezentace elipsy. Copyright © Institute of formal and applied linguistics, Charles University, Prague. ISBN 978-80-904175-9-5. 230 pp. BOJAR ONDŘEJ (2009). Exploiting Linguistic Data in Machine Translation. 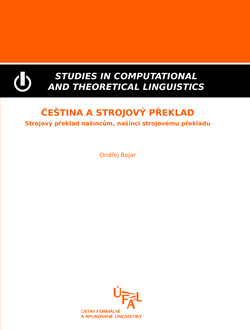 Copyright © Institute of formal and applied linguistics, Charles University, Prague. ISBN 978-80-904175-8-8. 119 pp. HOMOLA PETR (2009). Syntactic Analysis in Machine Translation. 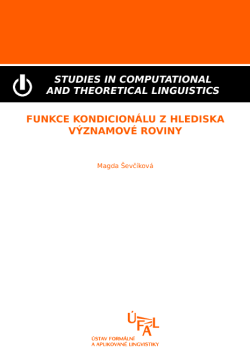 Copyright © Institute of formal and applied linguistics, Charles University, Prague. ISBN 978-80-904175-7-1. 110 pp. MÍROVSKÝ JIŘÍ (2009). 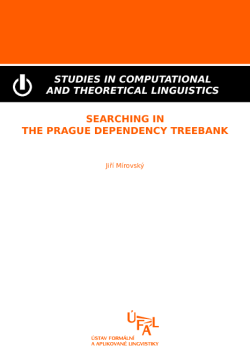 Searching in the Prague Dependency Treebank. Copyright © Institute of formal and applied linguistics, Charles University, Prague. ISBN 978-80-904175-6-4. 158 pp. PECINA PAVEL (2009). Lexical Association Measures: Collocation Extraction. Copyright © Institute of formal and applied linguistics, Charles University, Prague. ISBN 978-80-904175-5-7. 143 pp. CINKOVÁ SILVIE (2009). Words that Matter: Towards a Swedish-Czech Colligational Dictionary of Basic Verbs. Copyright © Institute of formal and applied linguistics, Charles University, Prague. ISBN 978-80-904175-3-3. 256 pp. ŠEVČÍKOVÁ MAGDA (2009). Funkce kondicionálu z hlediska významové roviny. 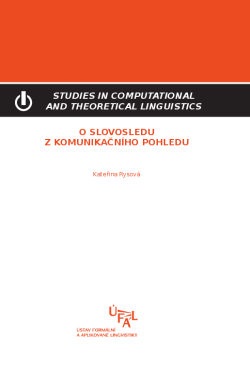 Copyright © Institute of formal and applied linguistics, Charles University, Prague. ISBN 978-80-904175-2-6. 179 pp.